Special Rules: The above are the default internal settings for this title and need not be changed. This is a Single Player, Single Credit ONLY variation. Continues are NOT allowed! Special Note: It is possible to earn extra lives throughout the course of the game. Additionally, “point-scrabbing” also known as “hunting” is allowed in this title, with the sole exception of unlimited hunting techniques in certain buffalo and robot boards within Act II, as per the Twin Galaxies Board of Referees. I'll start things off. 292,860. Played my first game trying to figure out why I couldn't shoot until I figured out I needed to tweak the default controls to work right with my two joysticks. Same here. Also, the default MAME controls didn't make any bloody sense on my 360 gamepad. Does this game have a glitch? Sometimes the playfield and the graphics of the arena don't seem to match, resulting in an invisible wall that prevents me from going all the way to the wall. This goes on until I die in that level or complete it. I had levels in which I couldn't go all the way to the top, in others I coudn't go all the way to the left, in others I couldn't go all the way to the right, and you guessed it, there were levels in which I could't go all the way down. This is a bit bothersome if an extra appears in that zone, because you can't collect it. I even once tried to run past a mine and promptly exploded because that damn invisible wall stopped me. This happens in MAME .149 & .161. I ran into the same issue with invisible walls. Maybe it's a feature with some indication that we're missing? Interesting. I've not noticed any invisible walls but I'm playing on a dedicated machine not MAME. I'll fire it up on my MAME rig and see if I get the same results. I tried this out last night. I don't remember ever playing it before. Kinda reminds me of that movie where Arnold Swarznegger and Jessie Venture have to go out and battle others while being filmed on live TV. Didn't really get a score worth posting. Took me a few deaths to figure out the land mines weren't things I'm supposed to pick up. I've been playing tons of Robotron lately so the controls actually felt very familiar. All scores are worth posting. I think it would encourage more people to play in these competitions if there were a wider range of scores. No, the actual game doesn't have any invisible walls on the levels. I dumped a lot of money into this one when it was new. "Additionally, “point-scrabbing” also known as “hunting” is allowed in this title, with the sole exception of unlimited hunting techniques in certain buffalo and robot boards within Act II"
Does this game have a glitch? Sometimes the playfield and the graphics of the arena don't seem to match, resulting in an invisible wall that prevents me from going all the way to the wall. No, the actual game doesn't have any invisible walls on the levels. That makes sense. I've seen that many, many times. "You can leech by simply grabbing the treasures and cash as long as you can avoid the grunts, killing only if they get too close. Keep it up and tanks will eventually start coming into the arena. They're worth a good few thousand points per kill (7000 or 8000 I think). Normally I get around 68000-73000 on the first room, but I was able to take it to 230000 once." Jasonbar did this in the original challenge. I got pretty good at dragging out room 1 & picking up lots more prizes & cash, then picking off tanks when they came to hurry me along. I managed to get 160k on my best effort on room 1. How about no Mame and only those with working boards can play. Because MAME = cheating. How about no ark_ader in this forum and everyone has fun. Thanks for the clarification. I've played this game forever and that strategy never once occurred to me. The goal was always to clear each level as fast as possible. I almost removed that verbiage from the rules when I copied them from the original contest. I have tried it and got about 115k in area 1, but that strategy is not for me. I get maybe one good run in 10 games, and I won't waste my time like that for some measly points. Speaking of good runs... Got 2 extra lives and finally made it past the prize room. 1,014,550. Nice! Always good to get a score on the left-hand side with Smash TV. I tried this out last night. I don't remember ever playing it before. Kinda reminds me of that movie where Arnold Swarznegger and Jessie Venture have to go out and battle others while being filmed on live TV. "Smash T.V. is a multi-directional shooter arcade game which was released by Williams Electronics in 1990; [...] and is partly based on the 1987 movie The Running Man (which itself was based on the book of the same name)." 3,758,320. Here we go. Made it to stage 2 area 4. I have been playing Robotron this week as well, and they do share a lot regarding grunt behavior. The purple dudes are like....Ms. Pac ghosts...with diagonals, though they can be led into swaths or little collectives, diagonal being the shot path of most effect. Smash TV has no spheroids and enforcers, nor quarks and tanks, and makes up for it in filling the arena, rather than the field, as the isometric view lends some 2.5D to collision-detection. In Robotron it is being close to any Robo beastie on a plane facing you. You can sweep, like a doorway. Smash TV proximity is like a cylinder or cone. Sweeping is more like hooking. Another thing is cones of fires, requiring little movement, at least until over-run. Which suggests employing an assertive stance at some times. This is harder in Robotron, as the range of what is moving the way that confuses them, and off that....angle?....arc?....and they say, 'Yes, you wanted some, didn't you?' Smash TV is more forgiving, at least until its version of tanks come, and then a little bullet hell is cordially introduced. I'm having some good bits clearing paths, though not long enough to turn a million. I like the whole of this game. Anyone else having some fortune and good times? I have been wondering what patterns and flow I used in earlier good runs - and then I remembered. A certain way to weave around, baddie disposal like tossing a whip, watch them orient on it, a wave of irresistibility, and pick them off, leisurely - though surgical fire control will get you through the gangbus. Which brings up a final bit....weapon amount. Each has so many rounds - rather than time - meaning even more surgical fire control. Even in later rounds, there are brief pauses that may be the rounds that save you. I don't know whether it's that round/baddie-matched (let alone odds-against like Robotron). Successive weapons may add up, at least for same kind of weapon, and of course you keep them at the end of the boss round - to go to the podium onstage, get awarded your booty - and then probably one of the shortest cut scenes with some serious, though basic and primal, quality. I was coming for you, yam. I love the Robocop (to me) outrageous prize types. The car reminds me of the SUX9000. And then the 2600" TV. I got to play a bit today but could not beat my score. Had a blast playing though. Does that put me on the hook again or is there a rule about repeating? My apologies as I can't recall the new rules. You're on the hook again. Must have been wishful thinking. I'll get something posted later. Mr. Peabody's score actually is 3,453,090. That 2.7 mil score is what he had after beating the first boss. Hearing you comparing this to Robotron, talking about patterns, flow, cones of fire... I just have to ask: How does it feel to have been beaten by a noob? The game will be Circus Charlie. I'll get a thread posted later. You are the quick-study/need-to-achieve type, whether you like the game. I expect you to have the highest score in any comp. There are often many ways to something. In this comp I played less than ten games, the above being my last. How many did you play? Can you revert the top post? In this comp I played less than ten games, the above being my last. How many did you play? I think I needed those ten games to figure out that this is a twick shooter. I have never played any arcade games outside the score challenge, so I simply thought that this game has 4 oddly located fire buttons. After dialing the second stick in, I have played a lot more than ten games. So, for getting that score in ten games, kudos to you. I suspect however, that you have put much more time into twick shooters (such as Robotron) in general. 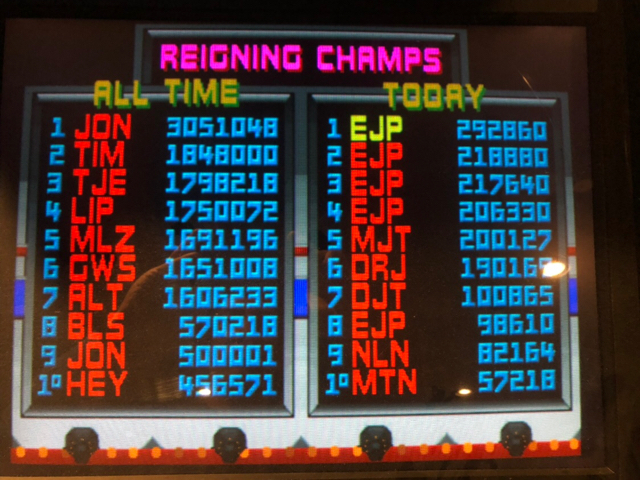 I have played Robotron for two weeks a year ago in the challenge, never having played it before (or after). I have put a lot of time into Enter the Gungeon, until I met the third boss, after which I gave up. But this is more of a bullet hell twick shooter, it doesn't really prepare you for a static screens with hordes of enemies. So this Smash TV score is something I'm actually a bit proud of. Forgive me the taunting. I expect you to have the highest score in any comp. wp34, did you by any chance change the number of the game in the topic title from 30 to 31? after that it's "Re: ALL NEW BYOAC High Score Competition! Game #31 Smash TV" again. Weird. Anyway, Smash TV is High Score Competition! Game #31, Circus Charlie is Game #32. Yeah I must have. I had some major problems getting the Circus Charlie thread setup as I was trying to clone the first post from Smash TV. I'll get the numbers corrected. @yam: no worries. I commend you on your quick progress. I do have some years on this and Robo, and continue to find things with new strategies, though incidental as I don't study games, per se, just play them and see what I find. On that note, and given the nature of the 'comp', I've been thinking of calling it something else....but what? Page created in 0.182 seconds with 58 queries.